Mousepads are a great accessory to have in an office or home space. Besides having a functional purpose Mousepads can become a great tool for branding since they have a large printable area and excellent visibility. Below, we have a short guide which will get you printing Mousepads with us in minutes! We use Sublimation Heat Transfer process for printing our Mousepads in full color. This process uses special sublimation inks that are printed onto “transfer” paper in the design specified by you. Next, the transfer paper is placed along with the substrate (mousepad) into a heat press to transfer the print onto the mousepad. 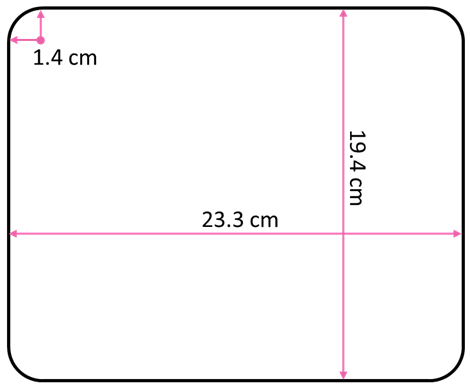 Bear in mind the dimensions of the mousepad while designing the artwork. The edges are rounded and hence will get cut off. Try to keep any important part of the artwork at least 5 mm from the edges of the mousepad. It will make things easier in case we need to make minor adjustments to the design size. All fonts must be outlined (changed to objects so that it cannot be edited by typing). The design should be in 300 dpi, at least and in CMYK colors. That’s about all there is to take care of. The Mousepads page is here. Happy printing!